The ultimate romantic master bedroom should be your personal retreat, your private domain. It should be blissful, luxurious, and reflect your personality. Surround yourself with things that make you feel good, which are comfortable, and add a bit of luxury to your daily routine in creating your master bedroom. Master bedrooms are the most enjoyable rooms to decorate. As Cupid’s big day approaches, many of us give thought to how our master bedroom looks and feels. To be truly romantic, the master bedroom should be comfortable for both men and women – not too frilly, and not too masculine. Choose a palette based on your favorite colors, and combine furnishings, textures, patterns, and fabrics that express your style. The one design element that grabs your attention when you enter the bedroom is the bed. How the bed is dressed sets the mood for the room. Bed linens can alter the style of the room – from formal, to rustic, to contemporary. A comfortable bed is important to find. The bed should be as big as possible and extremely comfortable. After all, we spend more time in our beds than anywhere else. If follows that the bed should be the most thought-out piece of furniture in our homes. Invest in a high quality mattress set, and dress it in the very best linens you can afford. After all, the bed is your place to curl up (with or without children) and be restored. I love pillows – whether you stack them or prop them, pillows are important design accessories for the bed and they offer extra support. Depending on the size of the bed, two or three European shams, two or three standard or king shams, and multiple decorative ones add extra allure to a bed. Mixing and layering pillows is a good rule to follow when making the bed. Never leave the box spring uncovered. On the right bed, a dust ruffle not only covers the box spring, but also acts as a visual frame to the linens on top. Dust ruffles can be made in may style, and should be long enough to graze the floor. Mix styles and finishes to create a more personal, interesting, and evolved over time feel. Matching bedroom furniture groups are not popular in today’s design world. Unusual and individual pieces with character are more stylish. Bedside tables are important pieces that work hard in a bedroom. These are the exception when it comes to matching pieces, however varying the styles can create much interest. I love Bombay chests as bedside tables. They are unique in shape, and offer storage as well. Furniture adds finishing touches to the romantic bedroom. Matching chests such as these can be stunning in a bedroom. Bedside tables should be 28-to-30 inches in height. Nothing is more disastrous to the design of a bedroom than tiny little bedside tables.Other wonderful bedside tables are mirrored styles. They’re glamorous and add sparkle and dimension to a room. Headboards today are available in numerous designs. Four-poster beds are still very popular, as are upholstered headboards. I love upholstered headboards, as they are comfortable when reading or watching television, and can be made in variety of styles from traditional to contemporary, and they provide an opportunity to repeat color and pattern in a bedroom. 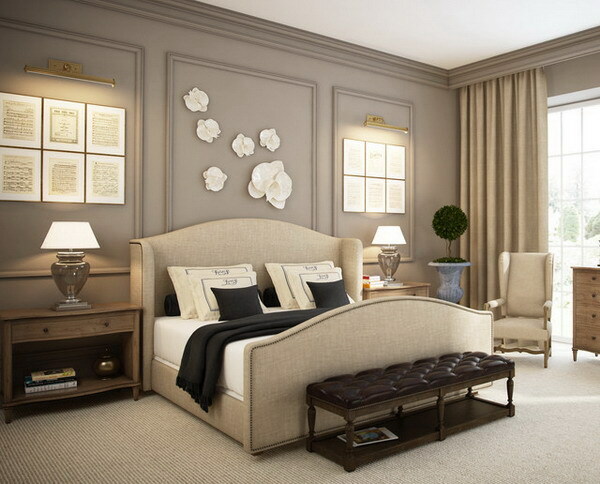 Seating areas in a bedroom are important spaces to place that cozy, comfy armchair or chaise to curl up and relax in. A spot by a fireplace for upholstered chairs and ottomans is the ultimate. Add a small table to place a cup or glass, a book, or the newspaper, and you may never leave. If you’re fortunate enough to have a boudoir, take advantage of the space and set up a mirrored dressing table. It’s a place to take time for nighttime rituals that bring the day to a close. Add touches that seduce the senses. Fragrance is important in a bedroom.Set out your favorite scented candles, potpourri, and fresh flowers. Romantic mementos are nice to display, or a collection of family photos. The master bedroom is the most personal room in your home. Allow yourself to feel indulged here, and at the end of the day, you can happily close the door to be alone – or together. 1 Comment on "Style Matters: Rest easy in a romantic master bedroom retreat"
Really it’s badly needed to feel splendid after end of the day, while with someone intimate. Loved all the tips you shared with simple and gorgeous words. It’s true that, the bedroom and the bathroom reflects someone’s personality. So, it should be the place of love, happiness and relax.